Old music becomes a joyous modern frolic. The sheer enjoyment she [Emma Curtis] derives from singing songs that encompass a huge spectrum of human experience is palpable immediately to the listener. This is antiquarian music thoroughly deserving the impassioned embrace it receives from Curtis and The Frolick. Calliope - Winner, Best Classical Vocal of 2006. Curtis is the type of presenter who overflows with both knowledge and enthusiasm for her subject, and she is extraordinarily successful here in taking the listener into the world she knows... Many songs' comic and melancholy takes on love wouldn't be too far out of place on today's pop charts if you replaced the kisses with sexual encounters, but others comment on the entertainment scene itself. Other songs seem to adumbrate details of later popular song traditions: the country girl who put on big-city styles in order to snag herself a prosperous husband makes several pert appearances, the Scotch songs that hit their peak a century later are already in abundance here, Many songs are flat-out funny; Maurice Greene's 'The Fly' and 'The Flea' just have to be heard to be believed... coquettes worthy of the Britney Spears of "Oops! I Did it Again" are delivered with maximum effectiveness by Curtis, who sings directly and clearly in a voice that one imagines was perfectly appropriate for the London drawing-rooms in which these songs would originally have been performed - the voice of a talented stage actress, perhaps, the equivalent of the musical-theater new-comer of our own time. A glimpse into early-18th-century London's social, political and cultural concerns, and well as revealing the kinds of songs popular for domestic use... Across the recital Curtis employs an impressive array of expressive vocal colours. Her deepest register is outstanding when used for natural sweet singing. The fact she occasionally sounds like a tenor comes in useful in Galliard's hunting song "The Early Horn". There is also beautifully crafted melancholy. These diverting and entertaining songs fully deserve their new lease of life. The Independent - Michael Church, Independent Album of the Week. [The Frolick] lifts the veil on a hitherto hidden corner to 18th-century English music, in the form of songs designed for domestic performance. The accompaniments on period instruments have great charm, and Emma Curtis's voice finds much scope for its innate versatility. Lovely sounds from the period-instrument ensemble The Frolick. Frolicking amid the songs.. is indeed God's plenty, and we are much indebted to contralto Emma Curtis and The Frolick for bringing English eighteenth-century domestic music-making so vividly to life... Arcadian fantasies, satirical pieces, raucous drinking songs and forsaken nymphs bewailing their fate - all and much more besides are tackled with startling fluency and a real sense of fun by Curtis and the Frolick, and ensemble whose members perform on instruments know to have been used at the time in domestic situations, violin and cello, drum and transverse flute, baroque guitar, lute and harp. Even now in AD 2006, Calliope continues her inspirational musings. Only she, feigning a chance encounter, could have brought the long-forgotten songbook Calliope to the attention of Emma Curtis, a contralto prominent in today's world of Baroque authenticity... 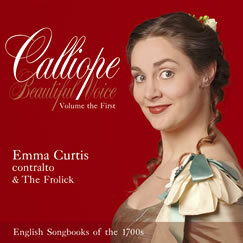 The Frolick exude their Baroque charms to accompany Emma Curtis, whose alto voice admirably suits the songs... Many of the songs, which are all in English, have that indefinable 'English' sound. It wasn't the cowpat sound of old modal Vaughan-Williams but the special sound of eighteenth century English music. More than just a collection of random songs, Calliope presents a fascinating look at the artistic and social milieu of 18th-century England. It's almost like a Hogarth tableau set to music. Contralto Emma Curtis does a marvellous job in this repertoire. She is adept as an actress and a singer, and creates a unique sense of character in each song. Whether it's a gin-soaked drinking song like "My Jolly Companion" or a doleful laments, Curtis is captivating. High marks to The Frolick, the instrumental ensemble that provides superb support in each song. Andrew Maginley's tender lute accompaniment is one of the high points.. and the entire ensemble rollicks in the hunting song "The Early Horn." Emma Curtis possesses a voice type commonly held to be an endangered species these days: she is a true contralto... she has a huge range, and also amazing flexibility. Engaging, intellegent performances of little-known English songs, many of which have a distinctive charm and power...hugely enjoyable... Her [Curtis'] theatrical experience and her versatility serve her well in the project. 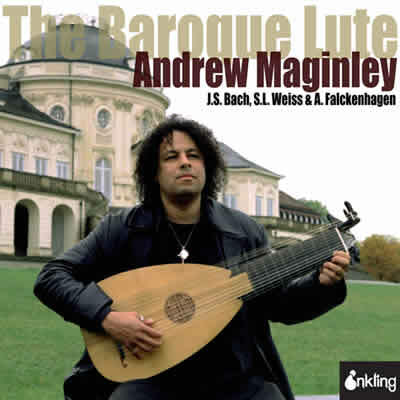 The Frolick offer fine, sensitive accompaniment, not least in the lute playing of the excellent Andrew Maginley. Emma Curtis sings with both appropriate gusto and fitting delicacy, with both humour and subtlety, as she explores the range of attitudes and emotions to be found amongst these songs... I urge you to let Emma Curtis and The Frolick effect and introduction. Popular songs published for home use as well as professional performers... a fascinating social document. Emma Curtis has the range to sing in both male and female characters, which is true to historical models, too, and she brings a raucous "stage" voice to some songs. A repertoire that has received little attention from either scholars or musicians, who tend to have rather more important things on their minds than unpretentious songs... Emma Curtis, therefore, deserves great credit for the extensive research she has undertaken in order to revive one of the most popular of the earlier songbooks... an object lesson in how such things should be done. My Community Blogspot.. stuff you're listening to.. I've been listening to this fun little 2 CD set called Calliope. It consists of selection from an 18th-century English songbook and tries to approximate the experience of what you might listen to if invited to an evening's entertainment at a private upper class home of the time. The selections are very diverse - folk songs, opera arias (Handel mostly), recent songs about the events of the day and so on. Curtis's voice is lovely and she manages to sound quite different in every song, abandoning vibrato and some of the more "operatic" qualities of her voice in the more popular tunes. All very nice. A treasure trove for fans of Baroque popular song. Curtis' voice is not only beautiful but remarkably strong and agile; she delivers the frilliest, most ornate passages with aplomb. She's also confident enough to sing badly on the drinking songs, which were undoubtedly delivered with many a duff note in their day. Highlights include Henry Carey's stately ballad "The Supplication", Thomas Arne's exuberant "The Miller of Mansfield", and Corelli's "The Praise of Bacchus", which provides a strong finale to the set. these composers make excellent bedfellows"